The theme for the 91st Scientific Assembly and Annual Meeting of the Radiological Society of North America (RSNA 2005) is "Connecting for Lifelong Learning." The meeting will be held November 27 to December 2 in Chicago, IL. In keeping with this theme, attendees will be able to choose from more than 300 refresher courses covering traditional and cutting-edge topics in a variety of subspecialty areas. These topics include 136 new refresher courses, 4 new refresher course tracks, 4 new Essentials of Radiology courses, and a new case-based review course. In total, 83 AMA PRA category 1 CME credits will be available at this meeting. Other educational programs include 150 infoRAD exhibits, 7 hands-on computer workshops, an Integrating the Healthcare Enterprise (IHE) demonstration, and more than 1100 educational exhibits. In addition, more than 680 companies are expected to present technical exhibits. According to the RSNA, exhibit space has already surpassed last year's final net square footage totals and now stands at greater than 469,000 sq. ft. This column presents a brief sample of some of the products that will be featured at RSNA 2005. 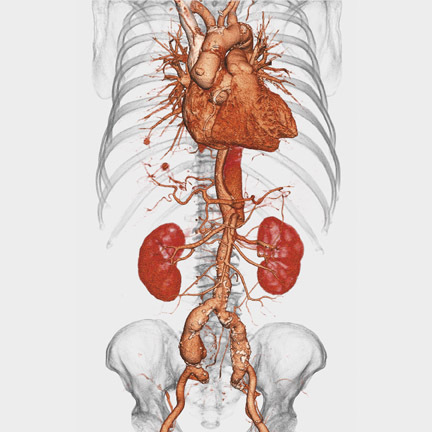 Toshiba America Medical Systems (Booths 7114 and 6913) will exhibit a wide range of radiology products, including the company's newest computed tomography (CT) system, the Aquilion LB (Figure 1). This system, which recently began commercial shipment, features a 90-cm bore opening and a 70-cm acquired field-of-view (FOV). Developed for use in CT simulation for oncology, interventional procedures, and trauma as well as for claustrophobic and super-obese patients, the large-gantry aperture provides more comfort for patients and improved access for patient positioning. The system features the company's QuantumPLUS detector that enables the 70-cm acquired FOV. This detector contains 40 parallel detector rows with 35,840 detector elements and a 32-mm length along the patient axis. It provides 16 0.5-mm slices with each 0.5-second gantry rotation. Combined with the detector length, this offers scanning of up to 96 mm/sec, allowing volumetric chest studies to be obtained within a single breath-hold. Whole-body trauma examinations can be completed within 20 seconds. The system also provides real-time helical reconstruction, permitting the user to observe the anatomy as the scan is being performed, thereby allowing the operator to check for patient motion and, if appropriate, the presence of contrast bolus. Toshiba will also showcase a variety of other products in a range of imaging modalities. For MRI, Toshiba will feature its high-field system, the Vantage, with an ultra-short 1.5T magnet. The system features a 65.5-cm patient aperture, 30 mT/m gradients, full 50 ×50 ×50-cm spherical volume, and the company's patented Pianissimo technology for noise reduction. The company will also exhibit Ultra, its 0.35T high-perfomance open gradient MR system that features 25 mT/m amplitude and a 100 mT/m/sec slew rate. Toshiba will also feature two new ultrasound products: The Xario and the Famio. Designed for a variety of applications, the small-footprint Xario features the company's new Intelligent Component Architecture as well as ApliPure for next generation spatial and frequency compound imaging. The system is capable of 4-dimensional (4D), multiplanar, volume rendering, and fast fusion 3-dimensional (3D) imaging. The Famio is a black-and-white ultrasound system that includes a 14-inch noninterlaced monitor, 2 active transducer ports, and a large-size image memory. Toshiba will also exhibit the t.cam line of gamma cameras and a variety of X-ray and vascular imaging products. BioLucent, Inc. (Booth 8209) will feature the MammoPad breast cushion (Figure 2) and the company's MammoPad Select program. Designed to reduce the discomfort associated with mammography, the MammoPad is a single-use soft foam cushion used to cover the hard surfaces of all commercially available mammography equipment. The MammoPad Select program is a certification and outreach program developed to certify breast centers as "Softer Mammogram Providers," thereby providing market differentiation for the center. The participating centers are supported with a marketing and communication program at no additional charge. The program includes all the necessary tools for promoting the center's use of the MammoPad to referring physicians, public relations partners, and the public. Certified centers can also participate in company-sponsored health education promotions during National Breast Cancer Awareness Month, Mother's Day/National Women's Health Week, and Valentine's Day. demonstrate several new PACS technologies designed to improve volume visualization and information management. Fuji will display advancements to its Velocity line of DR readers. Using the company's proprietary HD LineScan Technology, the FCR Velocity-T for table examinations offers a throughput of 150 images per hour, while the Velocity-U for upright examinations can produce 240 images per hour. Both systems can produce a fully processed image in less than 7 seconds and can accept a variety of imaging plates up to 17 ×17 inches. Fuji will also present multiple versions of their CR mammography (FCRm) system. At press time, this system was still subject to a pending premarket approval application before the FDA. The company will also show its Multi-Modality Breast Imaging Workstation, which is designed to provide the full functionality of Synapse for the interpretation of breast studies, or any other imaging study. Fuji will introduce a DryPix imager and will showcase the DryPix 4000, which was introduced at RSNA 2004. The compact DryPix 4000 produces 110 to 160 films per hour and offers 50-micron high-resolution printing. The system features an internal DICOM print server and accepts all common film sizes with an optional second film drawer and a top-mounted 4-bin film sorter. Fuji will also introduce several new CR products and will provide an update on the pediatric dose reduction study using the company's dual-side reading technology. At RSNA 2005, Planar (Booth 8308) will showcase their Dome flat-panel displays. The Dome E4c is a 4-MP color, 30-inch wide-screen, High-Bright bezel-less diagnostic display designed for use in radiology, cardiology, nuclear medicine, positron-emission tomography (PET)/CT, dermatology, and operative imaging. The system produces 16.7 million colors and 256 shades from a palette of 1786 unique shades of gray. It features a 700:1 contrast ratio and 330 cd/m 2 typical brightness. Applications include 2-dimensional (2D) color images, image fusion, and 3D reconstruction for volumetric and multiplanar images. The display also features automatic calibration with remote monitoring and maintenance capabilities. The Dome E3c is a 3 MP High-Bright color or grayscale imaging display with DICOM conformance. Featuring the same color and gray palettes as the E4c display, the E3c has a 400:1 contrast ratio and 400 cd/m 2 typical brightness. According to the company, with its High-Bright, this display enhances visualization of 2D color images, fusion images, and 3D reconstruction. The Dome E2c was designed for diagnostic viewing in PACS workstations, modality review, and multispecialty clinical settings. It features the company's high-bright backlight technology and offers fully automatic and continuous DICOM conformance. The contrast ratio is 600:1, and the typical brightness is 500 cd/m 2 . This display allows the user to perform multi-modality, fusion, and 3D-rendered image readings in the same panel. Among the grayscale displays, the 2 MP Dome 2 offers 3061 unique shades of gray with a 600:1 contrast ratio and a 900 cd/m 2 operating brightness. The Dome E5, approved for mammography and radiology, also features 3061 shades of gray and a 600:1 contrast ratio with an operating brightness of 850 cd/m 2 . The E5 also features full DICOM conformance, automatic calibration, and remote monitoring and maintenance. The Dome E3 grayscale display also features 3061 unique shades of gray, with a 700:1 contrast ratio, and an 800 cd/m 2 operating brightness. Staco Energy Products Co. (Booth 2566) will unveil its newest line of single-phase online uninterruptible power supply (UPS) products, the UniStar IIILA Series (Figure 3) at RSNA 2005. Designed for servers and networks, medical imaging equipment, telecommunications equipment, industrial equipment, or any sensitive electronic devices, the UnisStar IIILA features power protection over a wide input voltage range. Double conversion technology provides a constant steady sinewave to protect downstream equipment without going to battery mode. The system meets all industry standards for energy savings and low reflected harmonics. The unit's Smart Battery Management System continuously monitors battery status and recharges when necessary; hot-swappable battery packs allow the user to change batteries without shutting down. The system also features high overload handling without transfer to the bypass, and protection against short circuit and over-temperature conditions. The system is available in capacities of 1 kVA, 2 kVA, and 3 kVA. Each offers remote monitoring and diagnostic capabilities through the Web, networks, or an SNMP adaptor, and offers a 3-year warranty. WebMedEd (Booth 4778) is new to RSNA this year. A new venture of Anderson Publishing, Ltd., the publisher of Applied Radiology, WebMedEd (www.WebMedEd.com) is a multimedia medical education online portal that uses high-quality compressed video and interactive case studies to replicate live lectures. Designed for physicians, physician assistants, technologists, nurses, and administrators, WebMedEd provides Web-based mini-lectures, case study reviews, supervised scans with experts, over-read services, onsite physician preceptorship training, educational CD-ROMs, and more. The initial module (Phase I) focuses on the use of PET and PET/CT in oncology, cardiology, and neuroradiology; the physics and instrumentation of PET and PET/CT; and the business of PET (coding and reimbursement). 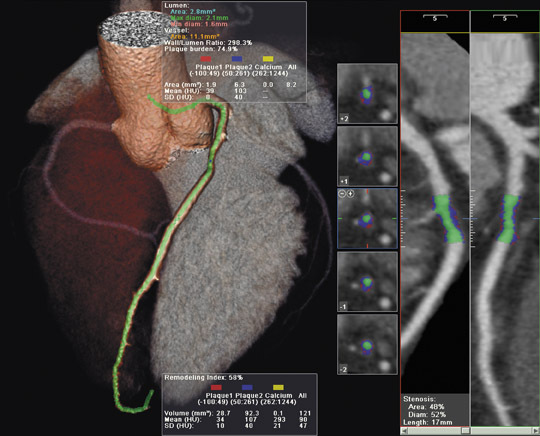 Future modules will address other areas of radiology and cardiac imaging, including cardiac CT, CT angiography, diffusion MRI, MR angiography, and vascular ultrasound. Each section is coordinated by an experienced healthcare professional who determinines which educational modules are included in each section. All educational modules will be accredited for AMA Category 1 PRA Credit for physicians, ASRT Category A CE Credit for technologists, and AACN CE Contact Hours for Nurses, where appropriate. The company hopes to offer online accreditation for international physicians in 2006. At RSNA 2005, be sure to visit Applied Radiology (Booth 4778). See you in Chicago! Technology and Industry: RSNA 2005 preview. Appl Radiol.